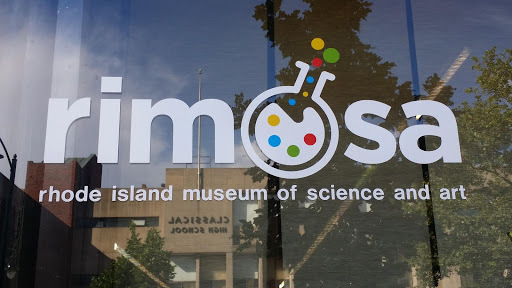 Welcome to The Rhode Island Museum of Science and Art, (RIMOSA)! A designated non-profit since 2010, RIMOSA’s hands-on, open-ended STEAM (science, technology, engineering, art and math) based exhibits and programs – aimed at older children, teens and families – emphasize the tools that both artists and scientists share; curiosity, observation, experimentation and communication. We have both a physical site, and numerous outreach programs we facilitate throughout southern New England. What will you experience at RIMOSA? That depends on the day! In our approximately 2,000 square feet of museum space, we have constantly changing exhibits and activities. They may include Animation Station, where you can make your own stop-motion animations, bicycle powered Spin-Art where you can create a masterpiece with paint and centrifugal force or others. You may spend time in our maker space creating a marble roller coaster with pipe insulation-track, dominos and found objects, or, if we have PVD Makers Open Studio, perhaps you will use a laser cutter or sewing machine to make something. Although we are a small space, physically, the average stay is about 2 hours.